Hey. I began to slowly translate the mod to Russian. And at the same time to play it. I will say a few words: You're ugly assigned ID in textdb_xx.def. I find it difficult to work as an interpreter. The fashion itself is full of flaws. Vincenzo's not responding to the blows. Cars after leaving the bar are facing the bar, not the street. If Sam dies in a Motel, the game doesn't end there. And the shooting itself in the Motel is very difficult. There's nothing I can do. Too many enemies and they shoot accurately. a great mod and Yes how many just will parts of in Vogue. Thanks all for playing! The dubbing quality should be fixed next week, so the game should be even better! The translation – weird, I did the IDs much better than the last time. I will PM you a file with the dialogues, maybe that will help. Check it out. The hard mission – it is supposed to be not easy This is my playthrough, done in first try, with almost no sound. Can be done, Paradonz as well did it. But I got info from players that it is too difficult for some, so I will later release an easier version. Stuff like Vincenzo not responding – it is not important for now. Also, you are not supposed to hit him in the first place But I’ll fix it, thanks for noticing. Sam is supposed to stay in the room. If he goes out, I can’t do anything about it. If you had to make sure he doesn’t die, this mission would be almost non-passable. It does not matter if he dies, in the story he is OK.
Do you mean as turn on the mod from the 4 mission? If you want to start from the 2nd part, just put the contents of the "missions/4BAR" folder into the "missions/tutorial" folder and start a new game in Mafia. If you want to start from the 1st mission, you have to put the content of the "missions/1DOM" folder into "missions/tutorial" folder and start a new game in Mafia. Было бы интересно если бы последние миссии происходило в 1930, и еще откуда вы взяли скин Дона Пенпоне, и в каких годах всё происходит в моде. It would be interesting if the last mission took place in 1930, and still where you took the skin is not gear, and in what years everything happens in the mode. Well, I know what is going on in these years 1903,1913,1917. Hello! Veery nice mod, I saw it in Paradonz's video. I make my version of translation of this mod into Russian language, if you want, you can download it here. But I haven't tested it yet, may be some bugs or errors. Thanks, I'll add it to the main post I don't know how Melhior is doing, but if he will do the translation, it can be also added. Dubbing has been corrected, its quality is now much better! Thanks to Patryk (who played Yellow Pete and created the new models and textures as well)! Let me know how it goes! Remember, there will be more parts and more characters to dub. Sorry but I would like to ask how do I install this mod. I've read FAQ but it's not helpful. Can you add A Czech Language? 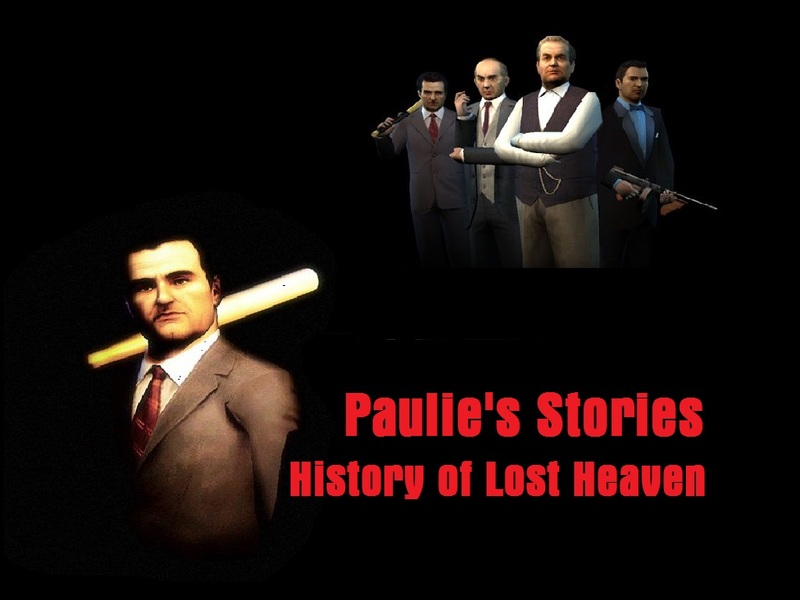 On mod Paulie's Stories is 2 version Russian translate, first version - by machigatteiru, second version until that there in an open access, because we make Russian dubbing on this translate. @Semlson - let me know if anything is done, I'll add it to the first post or on dropbox. @lub123 - I don't know Czech, so I won't make Czech version If someone creates it, I'll be glad to add it. 1) Install Mafia. Let's say in "C/Mafia". So, if you want to start the game it will be "C/Mafia/game.exe"
2) Download the "mod" folder from dropbox. Unzip it in "C/Mafia", so there you will have folders like "C/Mafia/missions" or "C/Mafia/models". 3) Go to "C/Mafia/Patch 1.0", take the file "mvs_francais" and put it in "C/Mafia". Run the file. In the "repertoire..." place choose "C/Mafia". When it's done press "Launch version changer" and "Terminer". Then choose 1.0 and press "changer". 4) Go to "C/Mafia/Patch 1.0", take the file "game" and put it in "C/Mafia". @mammix I can make it but i don't know how.